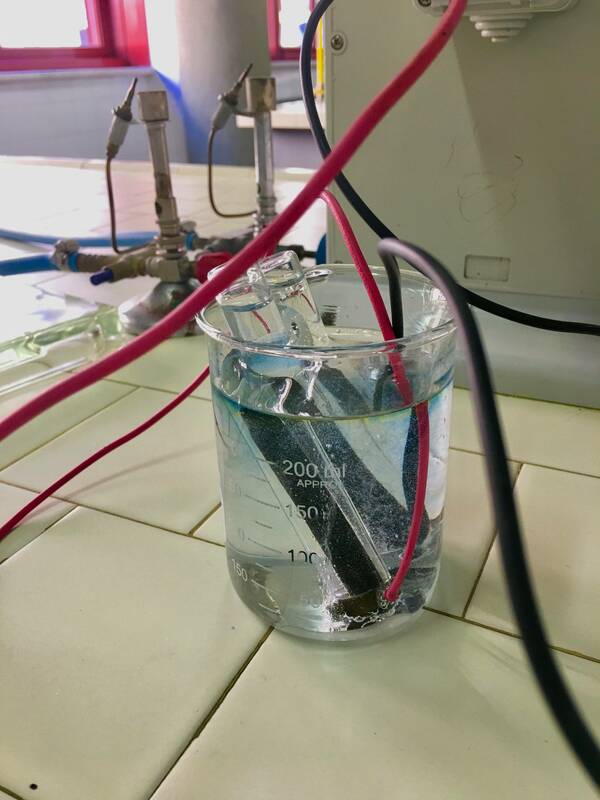 Today at school we tried the electrolysis with two graphite electrodes in a sodium sulphate solution. 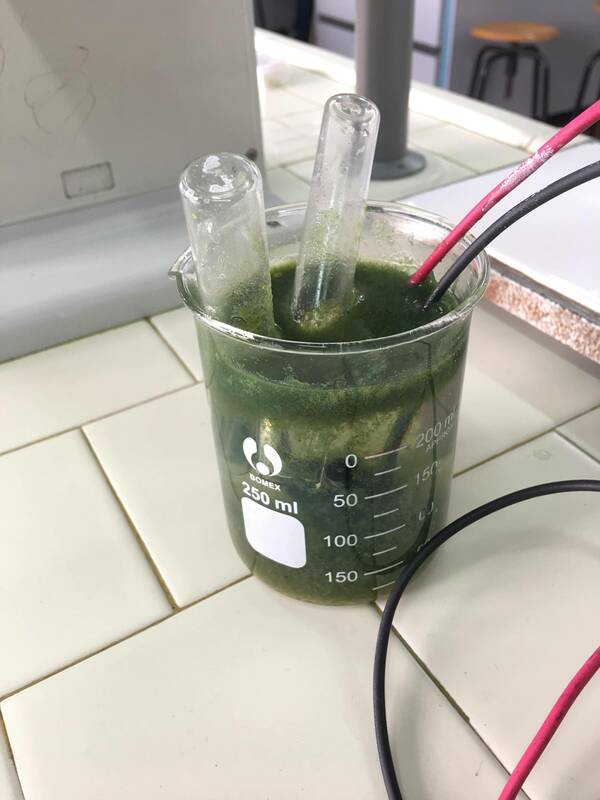 We put the electrodes in two test tubes and filled them with some more sodium sulphate so that the solution could react with the electrodes and after that, we quickly turned them over and put them in a beaker filled with sodium sulphate. After that, we added some bromothymol blue in it to see where the hydrogen and oxygen would have gone. Afterwards, we turned the power on and saw that it was producing gas and everything was normal at first (1st image). Some time after that we didn't see the volumes between the two test tubes changing so we waited some more. Later, we saw that the solution started assuming a green color and something started forming on the surface (2nd image). It became more and more green so we decided to turn the power off. Then we noticed that on the bottom of the beaker was something yellowish and brownish (3rd image). We checked if the wires were consumed by the solution or if they had reacted with it but nothing was wrong with them. I have no idea what it is and my teacher told me and my lab group to find an explanation to that. What is the problem here? I think that what possibly happened here is that the copper wire that connects the cable with the graphite electrodes is exposed in the solition (if you look carefully in Fig.1 there seem to be a lot of bubbles forming near the red cable insulation at the bottom of the tube which escape out of the tube). So copper is oxidising to give copper anions which give the coloured material in the solution. This is just a theory though. To confirm, repeat the experiment first with copper electrodes then with your graphite electrodes but ensure that only the graphite is in the solution (so get rid of the tubes). If using the copper elecrodes gives the same result as above (blue green stuff) while using the graphite electrodes just gives O2 and H2 it means that the above theory is likely. Finaly you could isolate the greenish solids by filtration, dry them and do a flame test. If the flame becomes green it suggests presence of copper further confirming the above. 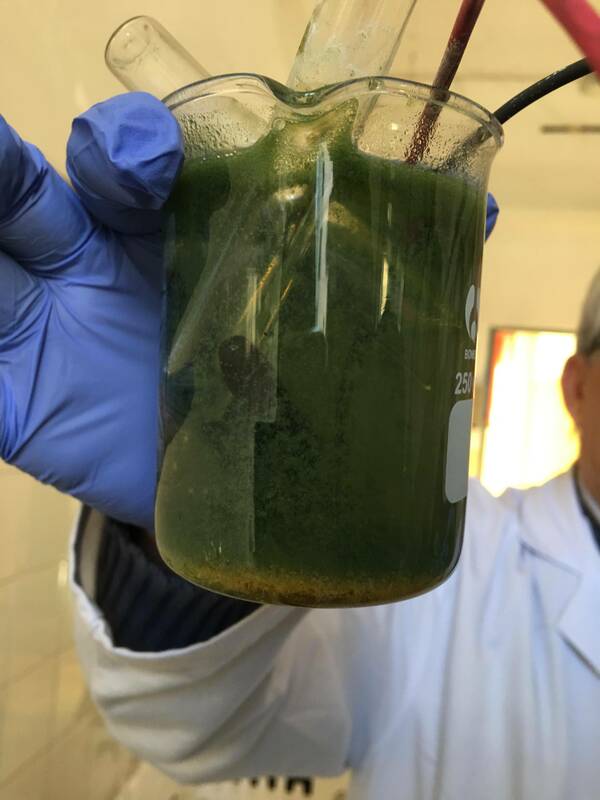 The only thing that doesnt fit with the above is that Cu2+ ions are blue and soluble in solution not green, so maybe the green stuff also (or only) result from some reaction with the indicator. Hence, it would be good to repeat the experiment with and without the indicator to see what happens (that makes 4 experiments in total). Not the answer you're looking for? Browse other questions tagged inorganic-chemistry electrolysis or ask your own question.